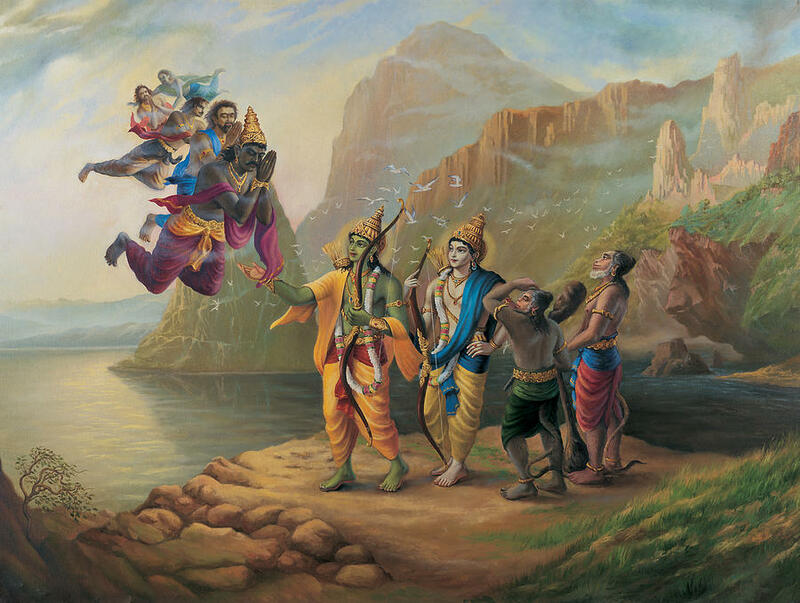 The epic tale of Ramayana is a story most people know by heart. From published books to TV series, we have seen, read or heard of the story all too well. It is also known to be a source of pertinent wisdom. The tale although is an ancient poem, the insights are even applicable now in the current era ages later. With the multifarious attempts to portray the story in various versions, many titbits tend to be skipped as per the need. After meeting Sita, Hanuman had set Ravana’s kingdom on fire with his inflamed tail. Ensuing, Hanuman took a dip into the waters of the sea to cool himself down, and due to the heat, the drop of his perspiration fell into the water. Some say that it was his reproductive fluid (Source) which had fallen. This drop went into the mouth of a giant fish like reptile creature, Makara which impregnated her giving birth to Makardhwaja. 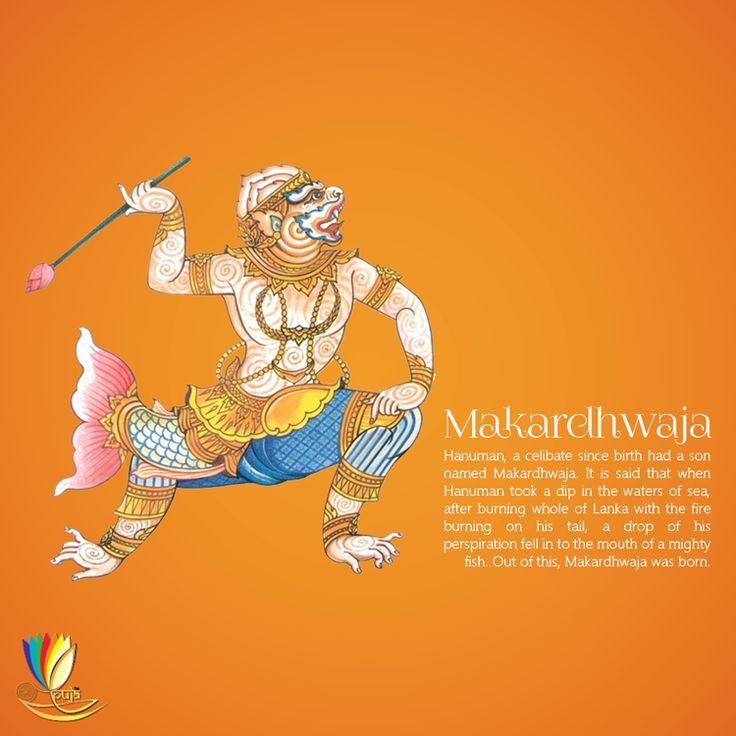 Makardhwaja, as the name says it all, he had the features of both a monkey and a reptile. Like his father, Makardhawaja was also brave and valiant. The villains of Ramayana, Ravana and his brother Kumbhakarna are considered to be incarnations of Jaya and Vijaya, the gatekeepers of Lord Vishnu’s world. It is said that due to their disrespectful behavior, they were refused entry into Lord Vishnu’s world and were also cursed by Brahma’s sons, Kumaras to be born on Earth.Jaya and Vijaya then pleaded Lord Vishnu to resolve the problem. Thus, Lord Vishnu then gave them two options, either to be born as his devotees for 7 life cycles or as his enemies for 3 life cycles, out of which they chose the latter, as it would be 4 lesser years away from their Lord. Hanuman’s birth stems from an interesting story which states that he was born to the king of Vanaras, Kesari, and Anjana who was a cursed angel born as a female monkey. Hanuman was said to be a boon from Lord Shiva and also an avatar of Lord Shiva as well. Except The Ramayana authored by Valmiki, many writers have penned various versions of Ramayana, including writers like Tulsidas, which is also called Ramcharitmanas and a derived version known as The Ramakien which is also Thailand’s national epic. The concept of Lakshman Rekha has different stories. In the epic authored by Valmiki, the story is as such that Lakshman goes ahead to search for Ram after saying a prayer asking the deities of the forest and the Pancha Bhootas to protect Sita. The concept of Lakshman Rekha is said to have been adopted by poets and writers of a later period in their own literary works which eventually became a popular belief later on. Moreover, The Laxmanrekha is not mentioned in the Valmiki Ramayana. This is mentioned by Mandodri in Lanka kand in Ramcharitamanas. Sita was not the biological daughter of King Janaka. She was born to the Goddess of Earth, Bhumi Devi and was found by the king while plowing the earth as part of a puja, who then adopted her as his daughter considering her to be a boon from Goddess Bhumi. Laxman was also called “Gudakesh” which translates as ‘defeated sleep’ as he had conquered the human need for sleep. It is said that Urmila, her wife, and Sita’s sister slept both his and her shares of sleep so that Laxmana remained awake protecting Rama and Sita. She slept for the whole period of exile, i.e. for 14 years and only woke up when Laxmana returned to Ayodhya, whereas Lakshman didn’t sleep for those many years. Also known as the Pinaka, the Shiva Dhanush was the bow that could not even be lifted many Prince during Sita’s Swayamvar. However, it was easily moved by Sita during her childhood. Thus, that was why King Janak observed this incident and set the condition of Sita Swayamvar in the Ramayana. Later, Lord Rama not only lifted but even broke the Dhanus in the process of trying it. 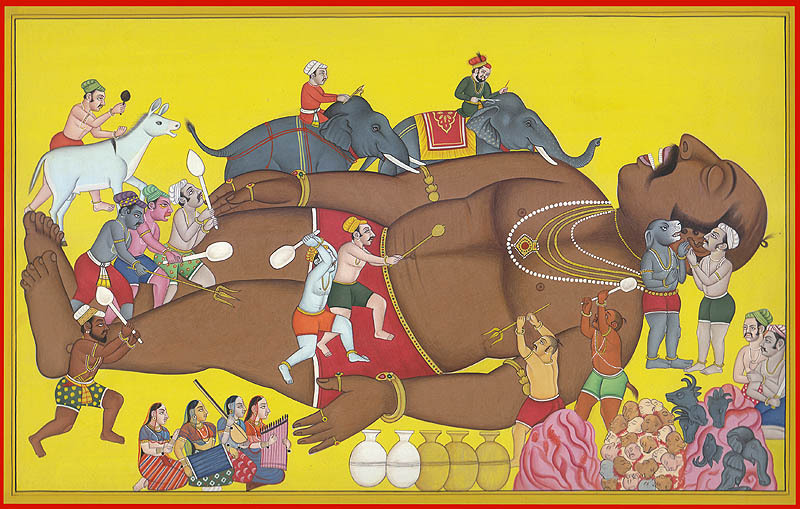 Kumbhakarna was considered pious, intelligent and brave that Indra was jealous of him. Along with his brothers, Ravana andVibhishana, he performed a major yajna and penance for Lord Brahma. When the time came for asking a boon (blessing) from Brahma, his tongue was tied by goddess Saraswati (acting on Indra’s request). So instead of asking “Indraasana” (seat of Indra), he asked for “Nidraasana” (bed for sleeping). 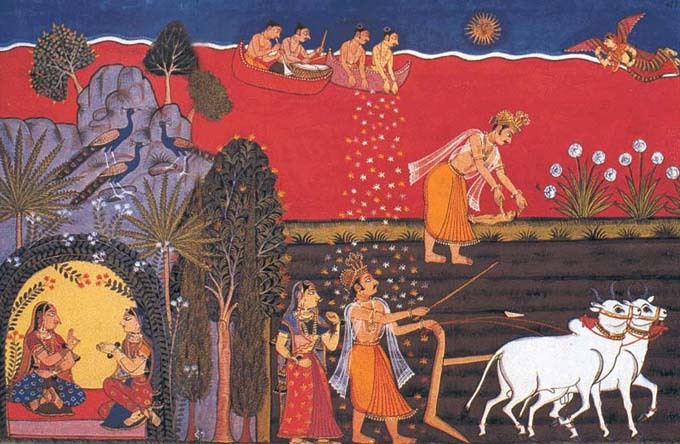 The root cause for the whole of Ramayana and Sita’s abduction was a curse. When Ravana and his brothers received a boon from Lord Brahma, they planned on invading the kingdom of Amaravathi, the capital of Indra’s kingdom. For the same, to achieve higher levels of power, Ravana started pursuing ‘Aatma Linga’. Lord Shiva impressed by his penance, he granted him a wish. However, Lord Vishnu tricked Ravana into asking Goddess Parvati’s hand from Lord Shiva instead of the Aatma Linga. Following, Goddess Parvati then cursed Lord Vishnu that he will also be separated from his spouse the next time he is born as a human.